McAfee, Inc. has released a new version of anti-virus solutions for the home series in 2014. Among them, the decision ” all-in-one ” McAfee Total Protection 2014, basic protection McAfee AntiVirus Plus 2014 and a comprehensive antivirus McAfee Internet Security 2014. New versions of anti-virus solutions McAfee Total Protection 2014, McAfee AntiVirus Plus 2014 and McAfee Internet Security 2014 is available for download at the website – home.mcafee.com. Among the major changes – support for the new operating system Windows 8.1, as well as improved scanning capabilities of the engine, safe search and online shopping, digital data communications and antispam. McAfee Total Protection 2014 provides comprehensive, proactive security that protects what you value and protects your PC from interaction with potentially dangerous Web sites. Consider the basic and enhanced features comprehensive solution “all-in-one” from McAfee. High-performance scanning engine (ENHANCED ) – was set up scanning engine of new generation. Its mission is to protect your computer against the latest viruses, Trojans , spyware, rootkits and other threats that reduce battery life and slow down your PC. Safe searching and shopping online (ENHANCED) – Thanks to a color icon , located next to each search query (including the popular social network) , you can find out whether a site is safe or not. Notice of digital data (ENHANCED ) – McAfee Total Protection provide information on the whereabouts of blocked IP- addresses, and that makes the connection unsafe. Protection against malicious pop-ups and ads – Websites do not always have control of content for the show, especially advertising. Sometimes you can detect unsafe ads on the site to which you are accustomed to and that visit almost every day. McAfee Total Protection 2014 automatically blocks suspicious and malicious ads that you stay safe. Antispam (ENHANCED) – All of these unwanted messages are not just annoying. They may be harmful. 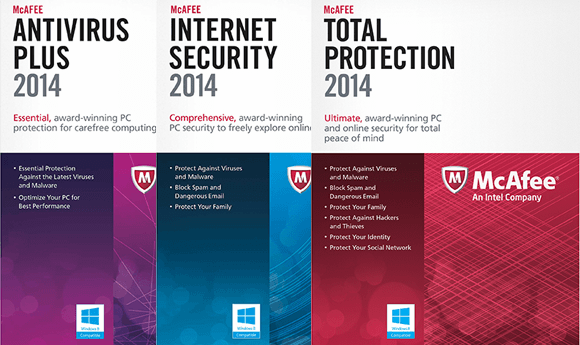 McAfee Total Protection 2014 filters out all the unwanted content, to protect you and your mailbox . Anti-Phishing – Identity theft is becoming more and more popular. McAfee SiteAdvisor LIVE technology helps avoid the dangerous sites by actively block phishing links, which you can get via e-mail , instant messaging and social networks. Parental Control – Worried about what your kids see stuff that is not meant for them? Parental McAfee Total Protection 2014 allows you to block unwanted sites with the rules on the basis of a specified age and adjustable categories. You can even limit the time they spend online . Plus, you can print a report for each of the specified users. Action Report – Find out what your children are doing online, through the surf report . You will know when they are logged on to their website nepolozhennyy , as well as how much time they spent on the Internet . The main screen – The new interface of the main window McAfee Total Protection 2014 makes it easy to use the product on touch-friendly devices. And it still works fine with the track Bol and computer mouse, so navigation on different devices is no longer a big problem. Security Reports – McAfee have changed the reporting system, allowing you to convey the necessary information visually interesting ways. New reports include relevant images and links for quick and easy understanding of what is happening in the world of computer security. Vulnerability Scanner – If your operating system (OS ) and the program has not been updated, you may be vulnerable to threats. New Vulnerability Scanner scans your PC for missing updates, and then recommends solutions that enable you to be safe again. Encrypted storage – In McAfee sure that everything on your PC should remain personal. Therefore programmaMcAfee Total Protection 2014 includes a module File Lock to protect your files. File Lock puts the files in a closed digital storage to your PC and prevents unauthorized access to it . Wireless Security – Unprotected Wi-Fi is like an open door for cybercriminals. McAfee Home Network Defense keeps it closed , protecting your passwords and personal files on your PC at the time of your use of the wireless network. Secure exchange of URL – it ‘s easy: to share photos and stories of your favorite social network. And it is easy to “send” a dangerous thing to others. McAfee Total Protection includes a utility to securely share URL, so that you stay safe even when the social network hacked. URLs Shortener – Worried about the random “tweet” unsafe information ? New integrated utility reduction options allows you to safely distribute news through updates and tweets that are short and safe. You can download the latest version of “all-in-one” anti-virus solutions McAfee Total Protection 2014 Antivirus with basic protection McAfee AntiVirus Plus 2014 and integrated antivirus McAfee Internet Security 2014 at official website of company McAfee, Inc.